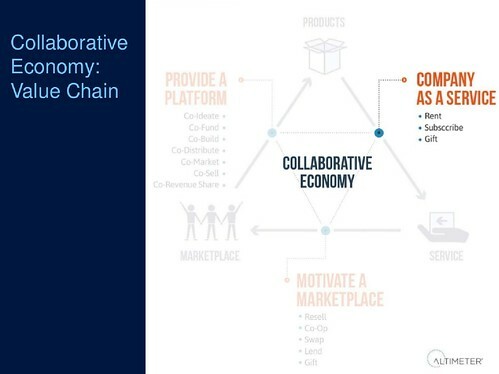 Above image is a screenshot from the keynote speech showcasing our research report on the Collaborative Economy, this post explores the first of three models. What can business leaders do to leverage the sharing revolution? Something counterintuitive, try other business models beyond selling to build a deeper relationship with customers, reduce costs of housing inventory, and generate more revenue. Top brands are doing this now, like Toyota Rent a Car, BMW hourly rental, are starting to rent their cars from their own dealership lots, rather than just offering traditional selling for consumer ownership. Why? consumer behaviors are changing, a movement has emerged that means people want to have access to goods –rather than owning them –is emerging. What should corporations do to respond? Offer a product on-demand access, subscription, and memberships so you can sell a product a thousand times over –not just once. To see all the transaction types in the Collaborative Economy, I’ve listed them out in a nice, neat table. We’ve already learned that through the sharing startups (here’s a list of 200+ of them), customers are now changing their behaviors. They want access to products rather than owning them, as people get towncars on demand like Uber, or media subscriptions on demand like Comcast or Netflix, or even getting products at no cost from their neighbors with websites like Yerdle, or even the anticipated Google Mine. In each of these examples, the company doesn’t own the products. Instead they are providing customers with access many times over, generating repeated sales. I’ve listed them out in a maturation order, so folks can activate in a systematic method. Thank you Scott Doniger for making this suggestion. 1) Sponsor the Movement Corporations can offer something these startups don’t have. Money, recognized brand, distribution, and marketing Who don’t offer physical goods, but want to be part of this growing collaborative movement. NBC sponsored Yerdle, Citibank sponsored NY Bike Sharing (read my write up), and Barclay’s card sponsored London’s cycle sharing. 2) Make available on-demand goods Rather than sell a product, corporations can make them available on demand in a rental type of manner. If you have a high-cost, or high-consideration product, or low usage product, considering offering it on demand, through a shared access model. 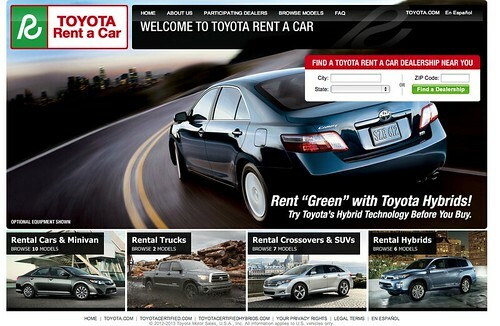 The example of a company selling goods is now augmented by Toyota rent a car from their car lots. 3) Provide a long term subscription Companies offer an ongoing subscription to recurring goods and services, all paid in advance on or demand Have products that are quickly consumed or companies that desire a long term relationship over seasonal sales Dollar Shave Club or Beauty Box or Bag Borrow or Steal offer subscriptions in the beauty and hygiene market. 4) Offer a lifestyle membership The highest form of maturity is providing a membership that gives access to many different products and experience –beyond your own product. Who want to extend beyond their core product offering, and offer an ecosystem of suites and products. Companies in tenuous markets. Peugeot’s Mu program gives consumers access to cars, bikes, busses, vans and more. 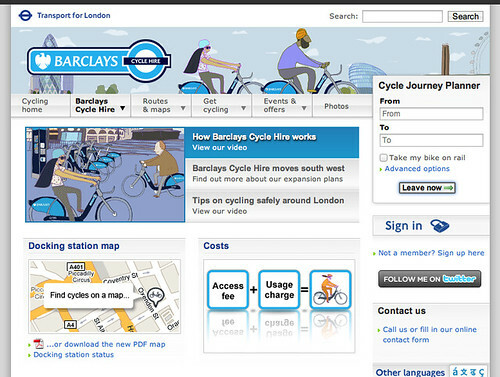 1) Above Example of Sponsor the Movement: Barclay’s, a financial institution, doesn’t sell bikes, so they sponsored a bike sharing program called Barclay’s Cycle Share. 2) Above Example of Make Available On-Demand Goods: Toyota, a company who traditionally sells cars from their dealership lots, now rents them on-demand in Toyota Rent a Car. 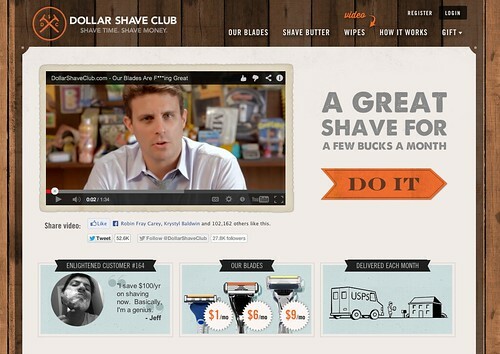 3) Above Example Provide a Long Term Subscription: For consumable products, Dollar Shave Club extends the customer relationship into an ongoing subscription. 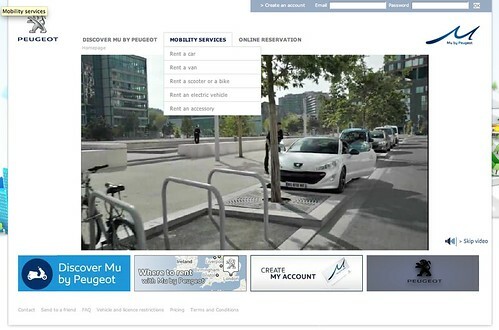 4) Above Example of offering a Lifestyle Membership: Beyond just cars, Peugeot offers scooters, bikes, busses, vans, electric cars and more in a mobility services called “Mu”. What are some of the business reasons that you’d want to shift your business model? Here’s a starter list, there are others, that are likely specific to your company. Satisfy new customers behaviors of access over ownership: If you’ve read the book Share or Die, which talks about how an upcoming generation of connected customers are living in a world of shared goods and services, this is a lifestyle trend that all marketers must pay attention to. To satisfy this behavior type of access over ownership, companies must first analyze their customer behavior and see if there’s a fit. Finally, have a long term relationship with customers. Don’t just sell a product once, and try to constantly resell it back to a customer season over season. Instead, offer a long term relationship where they join an exclusive long term relationship with your company and they make a promise (with money) to buy and buy again. Activate unused inventory into revenue. If you’ve idle inventories sitting around in your warehouses, instead, activate them by getting them to customers in a new way via an on-demand model. Turn those aging, depreciating liabilities into active moving products that can generate revenue many times over. Connect to a new emerging market. For some luxury brands and high-consideration goods, providing subscription models gives access to a younger or emerging market base that can’t afford your goods at full value. This builds a new relationship with this emerging market, loyalty, and is an entry point as they grow in their consumption needs. Add new value added services. There are many business models to generate additional value, and thereby revenue by offering new forms of insurance, cleaning, matching, and other services. Don’t just offer a product as a service, offer them a valuable package of services that can increase your overall purchase order. Make more money: Sell one product a thousand times over. Rather than sell a product once time, and risk customers sharing it with each other reducing your revenues, change your mindset that you can sell one physical good over and over. I heard this quote from BMWs innovation lead at a Stanford event on the sharing economy who’s vision is to “sell” one single car dozens of times in a day, generating new value for the customer and new revenues for BMW. Reduce global waste as products are used efficiently. At a macro perspective, reducing excess products being sold that are used effectively isn’t just smart for planet Earth, but also the sign of a responsible consumer and corporation. Thank you Justin for the suggestion for this bullet point. Software vendors galore for subscription software: For our research, we interviewed subscription provider, Zuora, who’s tightly wound with Salesforce, but also know there are a number of players including, eVapt, Vindicia, Aria Systems, Fusebill, Recurly, Chargify, Transverse, and CheddarGetter (best name, in my opinion). This is clearly a mature software space, so the technology is ready –business models at companies are just getting changed. The Collaborative Consumption group has a new white paper written for WEF. Read Lisa Gansky’s book The Mesh which talks about this growing trend. Thank you Deborah Schultz for helping to craft the term Company as a Service during the research interviews. At first go around, I was headed towards Brand as a Service, but she reminded me that it’s bigger than a brand. The Company as a Service is only one of three new models you must consider, read the full report, the Collaborative Economy Value Chain to learn more or learn about the third model the Provide a Platform on this post. To close, new business models are emerging that gives corporations the opportunity to sell a single product a thousand times, and in the Collaborative Economy, we call this Company as a Service.